Up to 40 of the finest malt and grain whiskies are matured before being skilfully blended to give a warm taste and lingering finish. This is a smooth, rounded and elegant style with notes of barley and a soft floral character, followed by raisin flavours and hints of honey on the finish. Fine aged Bell's Blended Scotch Whisky; committed to the same exacting standards by Arthur Bell since 1825. The Blair Athol malt in the blend gives Bell's it's distinctive and much loved rich, fruity flavour. BELL'S & Cola Long Mixed Drink 1 12oz ?25ml Bell's ?125ml Cola Build ingredients over Ice with a Lemon wedge (1 Unit). 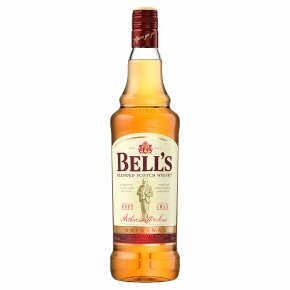 The rich taste of Bell's comes from the fine malts such as Blair Athol, the heart of the blend, and Dufftown, Glenkinchie, Caol Ila, and Inchgower, all selected by our master distillers. Bell's is extremely versatile and accessible in taste profile - enjoy neat or with a mixer.Bell's Blended Scotch Whisky comes from some of the finest malt whiskies in Scotland - from the fresh, sweet malts of Speyside to the smoky sea salt of the Islands - all matured in selected oak casks for a richer flavour. The malt at the heart of the Bell's blend is rich, spiced and nutty, and comes from our home, the Blair Athol distillery.